March Madness!!! Also known as, the beginnings of a beautiful Spring! Last week, I said to my husband, "This week, I'm going to list at least one new piece of jewelry in my Etsy shop every single day this week-- Starting Monday!" YAY! What a great idea. I was committed. But then, I was sabotaged! My camera broke. I turned it on Monday morning to photograph some really cool repurposed vintage jewelry necklaces I had recently made, but I got a message on the camera screen telling me my lens had malfunctioned. And once it gave me that message, the lens just stayed stuck and the camera was inoperable. So I spent the week making (but not photographing!) jewelry, shopping for a camera, and waiting for it to be delivered. It arrived late yesterday afternoon! HK loves the camera so much, she wants to eat it! I'm going to make and list a new piece of jewelry for my ResparkableVintage shop over at Etsy.com every day of March. 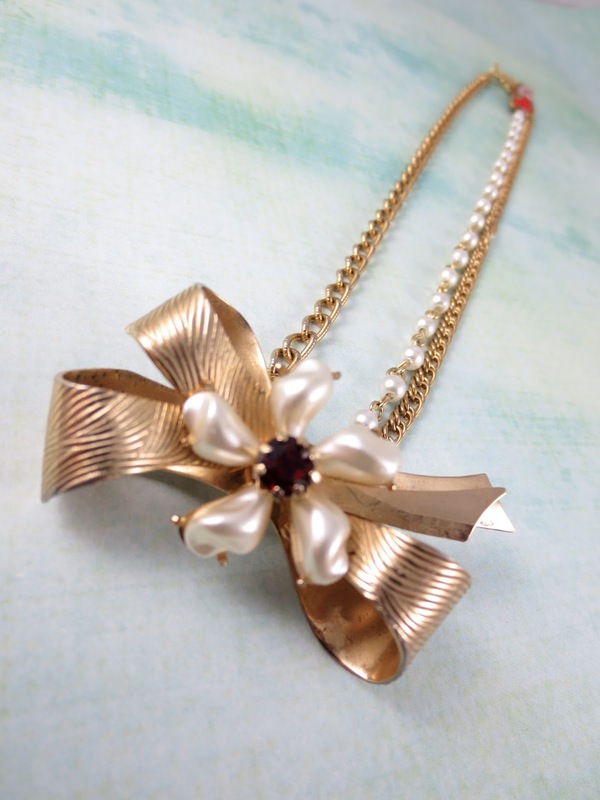 Coro vintage brooch- Repurposed with other vintage and new components to make this necklace. Hopefully, I'll start getting a lot more traffic to my shop with more lovely merchandise to choose from. I'm also going to list the jewelry of the day on Facebook, and hopefully sweet peeps will spread the word by sharing it, and I'll have more visitors. I love a good month long, self imposed challenge to get me motivated! Seriously, I am so excited. Nothing do I love more right now than creating jewelry. Besides playing with my dogs, it's all I wanna do!!! St. Patrick's Day- Don't Pinch Me!